Who will Hillary Clinton and Donald Trump–the Democratic and Republican Party’s likely nominees for president, respectively–pick as their vice presidential running mates? Let’s start here: It probably won’t matter much. Or, we should say, it probably won’t matter in terms of deciding the election. It could matter a great deal, however, in terms of what comes after the election. Allow us to explain. Every four years, journalists and political analysts devote an extraordinary amount of time and attention to speculating about who will (and should, or at least could) win what is commonly known as the “veepstakes”–that is, who will be selected by a major party’s presidential candidate to run alongside him/her in that year’s election and, if elected, to serve as vice president of the United States. The assumption, often implicit, underlying such speculation is this: Running mates can deliver votes from strategically important groups within the electorate–e.g., residents of a key battleground state or an important demographic minority group–and with this change the outcome of the election. The opportunity to alter history through sheer strategic brilliance is an irresistible fantasy for any campaign manager or political junkie, which is what makes the veepstakes so fun to play. But, according to our research, in most cases it amounts to just that: a fantasy. 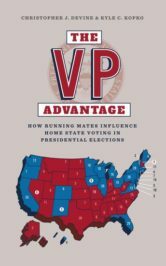 We have found no evidence of a systematic vice presidential “home state advantage”–that is, voters are no more likely to vote for a party’s presidential ticket when its running mate comes from their home state, generally speaking. However, this advantage does occur under a narrow set of conditions–specifically, when the running mate comes from a relatively less-populous state and has served there as an elected official for many years. If the running mate fails to satisfy both conditions, the ticket will perform no better in the home state than it would without him/her on the ticket. In contrast, presidential candidates generally earn a statistically significant home state advantage. Why? Because voters typically vote based on the presidential candidate’s characteristics, not the running mate’s. Indeed, presidential and vice presidential candidates prove more popular among home state voters, we find (using American National Election Studies “feeling thermometer” measures rating each on 0-100 scales). But this popularity only translates to votes for presidential candidates. We found a similar pattern of results when examining the performance of running mates from underrepresented demographic groups, including women (Geraldine Ferraro, 1984; Sarah Palin, 2008) and Catholics (Sargent Shriver, 1972; Ferraro, 1984; Joe Biden, 2008; Paul Ryan, 2012). Voters from the same demographic groups rated these running mates more positively but, once again, proved no more likely to vote for the presidential ticket on which he or she appeared. By contrast, Catholic and African-American voters were significantly more likely to vote for presidential candidates John Kennedy (1960) and Barack Obama (2008), respectively. Again, voters seem to be voting for the presidential candidate, first and foremost. What does this mean for the presidential candidacies of Hillary Clinton and Donald Trump? Quite simply, it means that voters will be voting for or against Hillary Clinton and Donald Trump, not their running mates. Let’s let that sink in, by way of example. If Trump picks Florida Senator Marco Rubio as his running mate, Floridians will still be voting based on what they think of Donald Trump, not Marco Rubio. So will Latinos (Rubio is Cuban-American). So will Catholics (Rubio is Catholic). Each group of voters can be expected to like Rubio better than others voters, but they will be no more likely to vote for the Republican ticket than non-Floridians, non-Latinos, and non-Catholics. Rubio will not “deliver” these voters, in veepstakes parlance, like a shepherd in control of his easily-manipulated flock. Voters have minds of their own, and those minds will be focused on evaluating their actual objects of decision, presidential candidates Hillary Clinton and Donald Trump. So, this means that vice presidential selections don’t matter at all, right? Wrong. Vice presidential selections matter a great deal, but not for the reasons usually animating veepstakes speculation. It is very unlikely that a running mate will deliver a home state or a demographic group that will change the outcome of the presidential election. However, it is a modern certainty that the vice president, once in office, will play a significant–albeit largely informal and advisory–role in the governance of the United States. With this in mind, each presidential candidate, and the country for that matter, would be served best by evaluating a vice presidential finalist’s ability to function as an effective partner in running the country. Electoral credentials–what little influence they bear–cease to be relevant on Wednesday, 9 November 2016. Governing credentials, on the other hand, will be relevant for four or eight years to come. This is why, if the presidential candidates are wise, they will follow the empirical evidence (and, one would hope, their conscience) by thinking beyond Election Day when vetting potential running mates. Featured image: “New Executive Branch” by Steve Jurvetson, CC BY 2.0 via Flickr. Dr. Christopher J. Devine will begin serving as an Assistant Professor of Political Science at the University of Dayton in Dayton, Ohio, in the fall of 2016. He earned his Ph.D. in political science from The Ohio State University. You can find him on Twitter. Dr. Kyle C. Kopko is an Associate Professor of Political Science and the incoming Assistant Dean for Academic Achievement and Engagement at Elizabethtown College in Elizabethtown, Pennsylvania. He earned his Ph.D. in political science from The Ohio State University. You can find him on Twitter. Website: www.kylekopko.com.